LS1 through LSX Up and Forward Turbo Headers. Header flanges are made with 3/8" thick 304 SS and tubing is .065 wall 304 SS with 1-7/8" Primaries and 3" Slip Fit Collectors. Headers are fully tig welded and back purged. Header bolts included. Requires no gaskets. RTV sealant included. 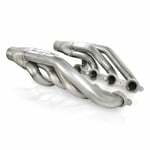 Forward turbo designed headers. Primary Tube Diameter (in): 1 7/8 in. Chevy small block Gen III/IV 4.8L, 5.3L and 6.0L LS style engines. Stainless Works Performance Exhaust Products are warranted against defects in materials and workmanship for a period of one year on all aluminized steel products. All stainless steel products carry a lifetime warranty. If a defect is found, it is at the discretion of Stainless Works Performance Exhaust Products to repair or replace the product. This warranty does not cover bluing or discoloration on the tubing, catalytic converters, or any shop labor or shipping costs incurred during the warranty process.